The original AD 17-07-10 was “prompted by a report of a cracked hinge support and cracked hinge ribs, which resulted in partial loss of control with the aileron binding against the cove.” according to the superseding AD 18-14-06. Go from Sad to Happy with the AD Toolbox Online! 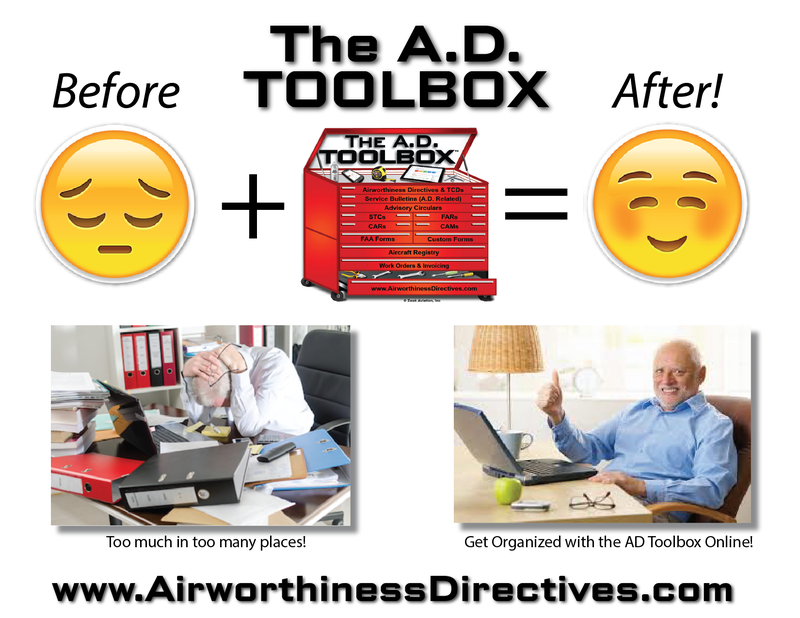 Go from Sad-to-Happy with the AD Toolbox Online! 1. Create, Save and Print a NEW Work Order. 2. Convert your Work Order to an Invoice. 3. Convert the entire Work Order, and/or Individual Discrepancies, to Logbook Sticker(s). 4. View and Edit previous Work Orders. 5. Print the Work Orders, Invoice and Logbook Stickers. Curious? Have questions? 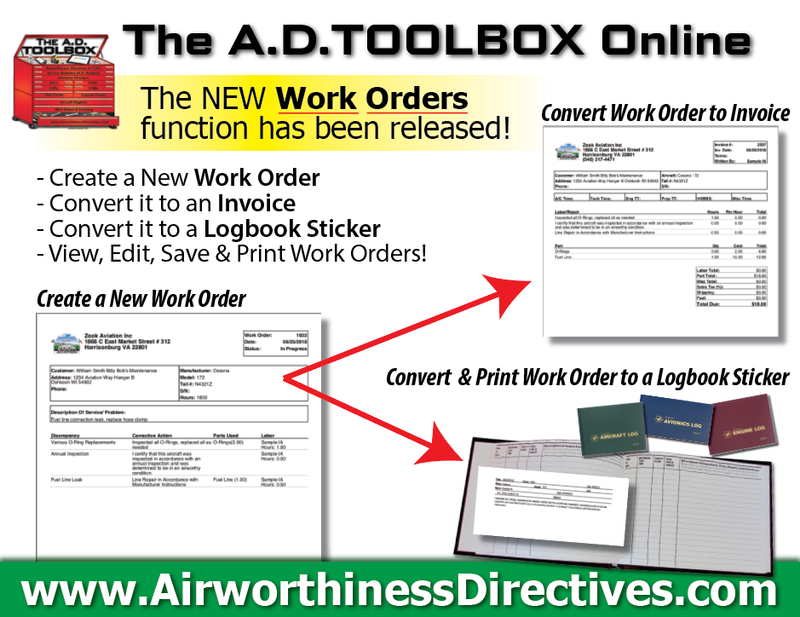 Give it a try by logging into your account at www.AirworthinessDirectives.com! Don’t have an Account yet? Sign up for a FREE Trial! 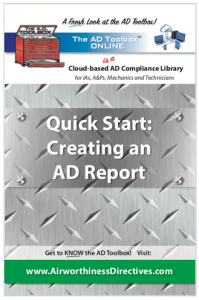 Author April ZookPosted on July 2, 2018 August 13, 2018 Categories AD Toolbox Online, ADs (Airworthiness Directives), Product Improvements1 Comment on Go from Sad to Happy with the AD Toolbox Online! Exciting BIG News! 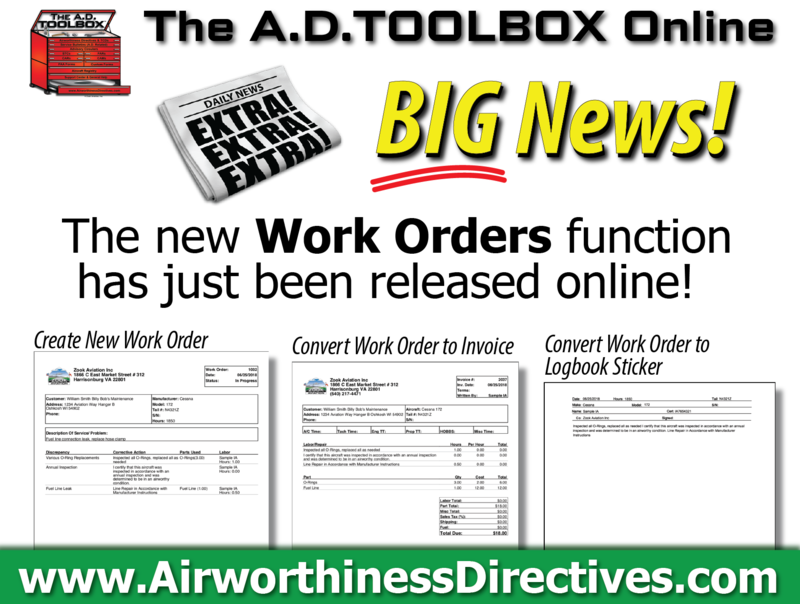 Today is the LIVE release of the new WORK ORDERS function for the A.D. Toolbox Online! -Create, Save, Print New Work Orders. -Convert your Work Order to an Invoice and send it to your customers. -Convert and Print your Work Order to a Logbook Sticker. Welcome to the Zook Aviation Blog launch! We’re glad you’re here, please stop in often for Product Improvements, Event Announcements (such as IA Seminars and Trade Shows), General Aviation industry news, as well as aviation humor and random stuff! Dean is a podcasting airplane mechanic who loves both planes and people. 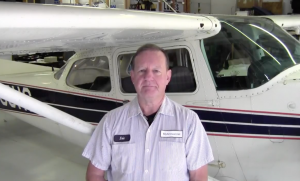 He's been working at Classic Aviation, LLC in the Shenandoah Valley of Virginia for the past 23 years. Meet Eric Barnhill with MyAnnual.net. MISSION: Helping you understand and manage the annual / condition inspection process and providing assistance with your maintenance / building needs.